DabigRG had the most liked content! I don't think Chip is very likely. At all. Unresolved plot threads? Also, I wanna say the soundtracks is subject to a different part of the team. The difference is that while those are indeed occasional complaints, they are generally made because it either overexaggerates an existing trait of the characters or portrays them in a manner that strays too far from how they can/should be characterized. And those characters can, have been, and will continue to be showcased in a variety of lights because of their existing character traits. People will only complain when it's done too much or when they do behave out of their long established ranges. As you note, Shadow never once participates in the overly comedic stuff in either this short or the previous. Is he in moments that are funny? Yes. Does he have moments that can be chuckled at? Sure. But it's never overt--whereas other characters make goofy faces or get smacked around comedically, he barely emotes and avoids getting hurt seamlessly. This whole thing just shows to prove that Shadow isn't a very flexible character to use, despite or rather because of his popularity. That in itself is a better constant than how Omega would've treated them. I can't believe I forgot about that here. You know what, that might've been cool. It helps that any of the three have little compunction about using the others as a means to an end. It's also worth noting one advantage to Classic is that it's an earlier and simpler timeframe, without the baggage of character development, epic stories, or dark tones to way it down. Classic Sonic does something snappy? Miles acts cute? KTE is uneasy around Classic Sonic? Rosy throws a tantrum? All fine and free game. Because from a certain point of view, Shadow has been too glorified and played seriously for the general energetic, fun, or even whimsical vibe the franchise generally goes with since day one. Thus if you're gonna use him, you better make damn sure it's a higher stakes and/or bigger scope story that takes his darker, more above it all characterization into account. Cause if you don't, you run the risk of that type of response. ...Wuh? 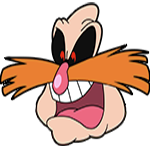 I think the difference is that those are often used to dramatic or horrific effect, whereas Eggman here could've just easily have been a hilarious thing in the background. Especially since it was already in frame for a good 5 seconds or so. Uh, I guess. Not sure. I guess they're either just using them as standard enemies for story races or simply not announcing them as playable because they sorta break the hype. I haven't watched Family Guy in quite some time, but I'm gonna say it was named simply for becoming a low brow comedy. Omega has always had an element of humor about him, it's just how overtly it's portrayed varies. So I think part of the issue here is that he doesn't have dialogue, which the bulk of his material. Though it's possible that the joke here is his occasional disregard for collateral damage. I agree with this, though another villain, with or without Metal Knuckles and Tails Doll, would indeed be cool. And PSPs are a popular console. Good point. Riders came out in 2004. Sonic isn't exactly in with the current decade. Oh gee, who could've predicted this sort of reaction.